St Kilda is an inner suburb (neighbourhood) of the metropolitan area of Melbourne, Victoria, Australia, 6 km south-east of Melbourne's Central Business District. Get a sense of the local culture at Rippon Lea and William Ricketts Sanctuary. 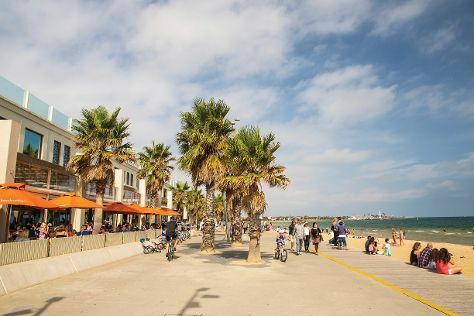 Escape the urban bustle at St. Kilda Beach and Brighton Beach. Explore St Kilda's surroundings by going to National Rhododendron Gardens (in Olinda), Werribee Open Range Zoo (in Werribee) and Dandenong Ranges National Park (in Dandenong). There's more to do: see the interesting displays at Scienceworks. To see maps, photos, other places to visit, and more tourist information, refer to the St Kilda trip tool . June in St Kilda sees daily highs of 16°C and lows of 7°C at night. Finish up your sightseeing early on the 1st (Sun) so you can travel back home.